I recently paid a couple of visits to Backcountry Brewing, a voluminous new brewery and restaurant on Commercial Way in Squamish. It was launched April 1st by a group of five beer enthusiasts, among them head brewer John Folinsbee and Ben Reeder, who – rather conveniently – also owns Maple Bay Hop Farm on Vancouver Island. Spread out across 7,000 sqft (with mezzanine office/meeting space), the operation is ramping up production from its 3,000 hectolitre start, offering memorable brews like Hot Laps Double IPA, Ridgerunner Pilsner and Trailbreaker Pale Ale, among several others. I guess they kind of have to since sales have been much higher than they had originally anticipated; Reeder told me sales were about 75% higher than hoped for — a nice problem to have. 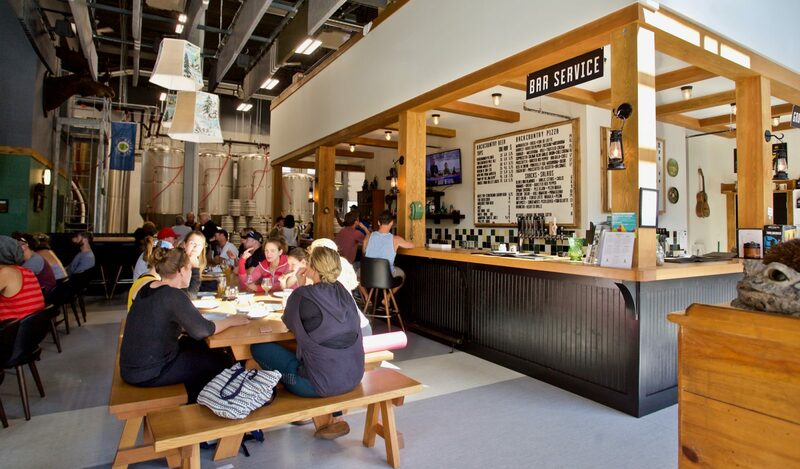 The Sea-To-Sky town has definitely seen its population explode in recent years, and I’m sure it helps that a fair number of the newcomers are enthusiastic about beer. It’s certainly great to see the local community respond well to a big effort like Backcountry. Many of our Squamish friends have been raving about it since its Spring launch. One of Scout’s writers, Shaun Layton — a recent Squamish import, pulls the occasional moonlighting shift here. The 2010 Bartender of the Year pulling pints! While I trust its popularity is overwhelmingly on account of the good beer and proper Neapolitan-style pizza, design also plays a big role here. Lending a large production facility of any kind some mentionable character is no small task and I think local designer Tanja Nargang deftly threaded that particular needle with clever, on-brand trickery. A fine job indeed.